Boris Slutsky (1919-1986) is a major original figure of Russian poetry of the second half of the twentieth century, whose oeuvre has remained unexplored and unstudied. The first scholarly study of the poet, Marat Grinberg's book substantially fills this critical lacuna in the current comprehension of Russian and Soviet literatures. 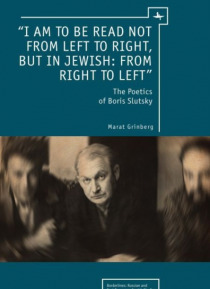 Grinberg argues that Slutsky's body of work amounts to a Holy Wr… it of his times, which daringly fuses biblical prooftexts and stylistics with the language of late Russian Modernism and Soviet newspeak. The book is directed toward readers of Russian poetry and pan-Jewish poetic traditions, scholars of Soviet culture and history and the burgeoning field of Russian Jewish studies. Finally, it contributes to the general field of poetics and Modernism.